Adventure(r) Bath Wipes feature thick, soft and gentle pre-moistened towels to clean, disinfect, and deodorize the body. Each wipe contains a unique formula that includes Aloe Vera, Vitamin E and Witch Hazel Astrigent that will leave skin feeling refreshed and moisturized. 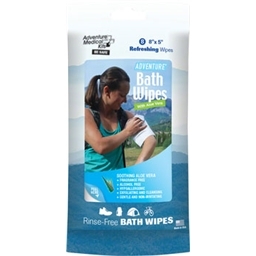 Adventure Bath Wipes are great for camping, backpacking, hiking, bike riding, and all other outdoor activities. 8, 8" x 5" wipes per package.